Wedged between the high wall of the Himalaya and the steamy jungles of the Indian plains, Nepal is a land of snow peaks and Sherpas, yaks and yetis, monasteries and mantras. Ever since Nepal ﬁrst opened its borders to outsiders in the 1950s, this tiny mountain nation has had an irresistible mystical allure for travellers. Today, legions of trekkers are drawn to the Himalaya’s most iconic and accessible hiking, some of the world’s best, with rugged trails to Everest, the Annapurnas and beyond. Nowhere else can you trek for days or even weeks in incredible mountain scenery, secure in the knowledge that a hot meal, cosy lodge and warm slice of apple pie await you at the end of the day. Nepal is nirvana for mountain lovers. Other travellers are drawn here by the adrenaline rush of rafting down a roaring Nepali river or bungee jumping into a bottomless Himalayan gorge. Canyoning, climbing, kayaking, paragliding and mountain biking all oﬀer a rush against the backdrop of some of the world’s most dramatic landscapes. 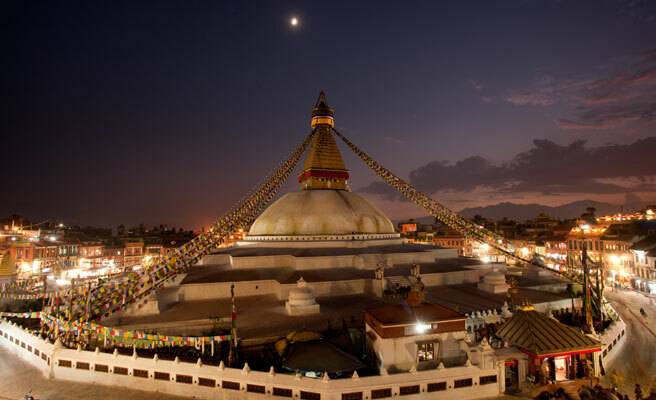 Other travellers prefer to see Nepal at a more gentle pace, admiring the peaks over a gin and tonic from a Himalayan viewpoint, strolling through the temple-lined medieval city squares of Kathmandu, Patan and Bhaktapur, and joining Buddhist pilgrims on a spiritual stroll around the centuries-old stupas and temples that lie scattered across the Kathmandu Valley. Further south lie Nepal’s wild and woolly national parks, where nature buﬀs scan the treetops for exotic bird species and comb the jungles for rhinos and tigers from the backs of lumbering Indian elephants. Whether you cross the country by mountain bike, motorbike, raft or tourist bus, Nepal oﬀers an astonishingly diverse array of attractions and landscapes.